Problem: Arduino 2009 with wiznet w5100 ethernet shield does not start network operations after power-up. It works well if the reset button is pressed. this solution requires a 10kOhm resistor, and a 10nf capacitor. 1. bend outwards the ethernet shield reset pin "leg", so that it will not go in the arduino reset socket. Here is a picture of one of my ethernet shields, with the reset "leg" bent outwards. 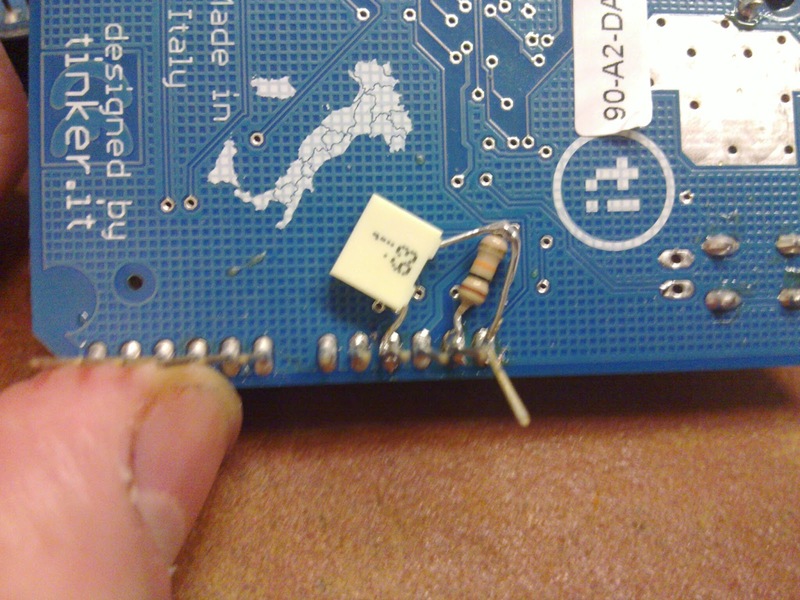 And this is the details of how I soldered the components on the back of the circuit. In this position the components are nicely arranged on the back of the board. With this mod, my arduino + ethernet shield is starting up correctly after powering up, and immediately works with no need of reset button push. Cheers! Your mod works fine. Tested with a 10nF and 22nF on 2 shields (ran our to 10nF). Both seem to be working fine, the shield starts up and I get a ping 3s after connecting power. Didn't work for me. I didn't have 10nF so I used a 20nF (labeled 0.02µF). No link. i wanted to test so soldered up the resistor to capacitor for reset lead and stuck the leads into top. but reset issue wasnt resolved. 10nf and 10k used. does it matter brand of ethernet shield? mine has sd card slot yours doesnt in example. Thank you very much Tahir. Sorry for having published your comment with long delay. Hope the other users will find your comment interesting and useful. Hello, thanks for the trick. It's working fine on a Mega2560 (but can't use the 5V of the card anymore - it freezes). Doesn't work for LEONARDO. Hi. I managed to have it stable using a 100nF cap, no resistor and the reset pin bent. However it only works when it is powered via the PC USB. If I use a regular 5V USB power supply I still have to reset it. Does the CC3000 wifi shield with SD reader suffer the same problem? la mia 5100 ha iniziato a dare problemi. Non funziona più Tx/Rx ho provato anche con il reset ma nulla. Oggi proverò a saldare la resistenza e il condensatore. La mia 5100 però ha l'sd a bordo. I'm an engineer working at WIZnet provides W5100 to Arduino. 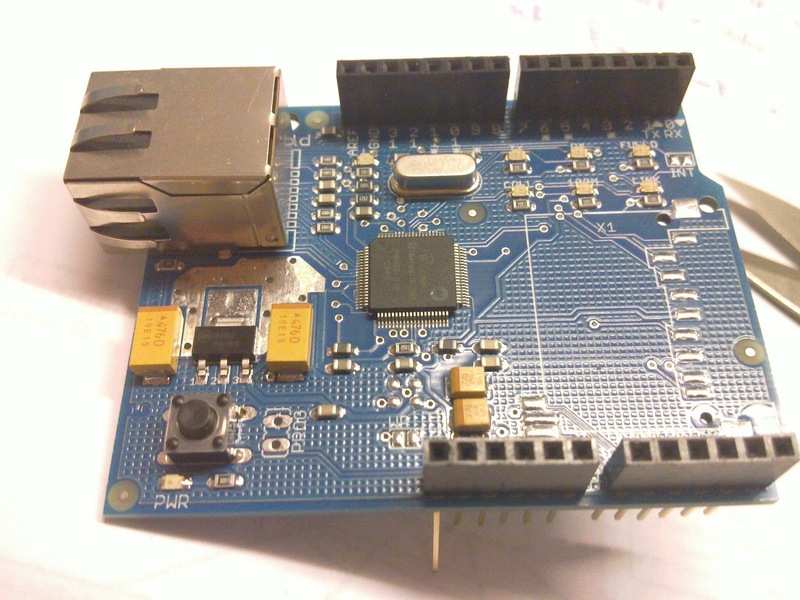 Arduino Ethernet shield does not designed with Power-On-Reset. Your Idea is so good. Can I introduce your some posts on WIZnet museum site(http://wiznetmuseum.com)? Hi, thank you for your suggestion. I have tried and I can confirm it's working. But for me, 10 nF capacitor was not enough. Then I was randomly picking some and for me, 1 uF (micro) did the job. No need to hit reset button now after reboot. Thank you! Thank you for your suggestion. I did it like you, but It didn't work. But when I tried 1 uF (micro) capacitor, it did the job! Thank you. No need to bend reset pin. I just wired all on a breadboard - 10k resistor and 1uF electrolit cap and all went fine. This capacitor would be, for example, a ceramic labeled as 103? With this mod when pressing the reset of the ethernet board should not produce a reset the arduino? It is possible that with some arduino boards there is this problem and with others not?